John Gilbert Winant, NH Governor, US Ambassador to England during World War II: Here. 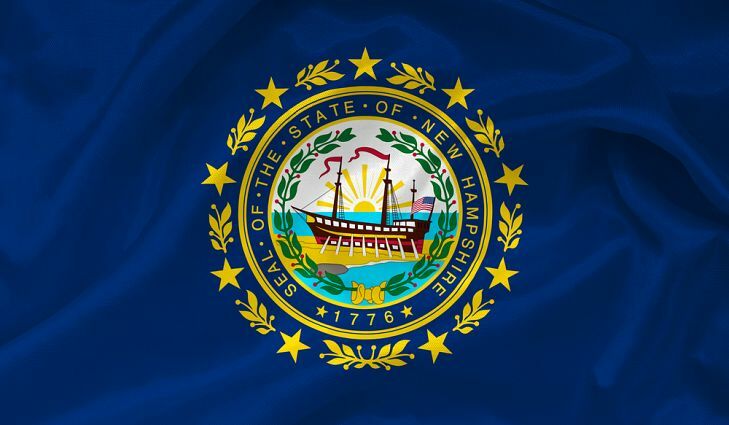 New Hampshire State Flag, current day. 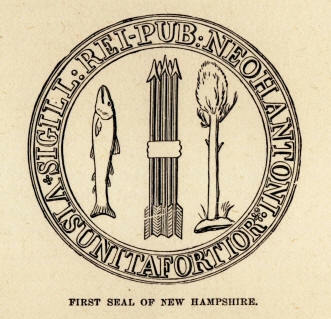 New Hampshire's first seal, created in 1775, consisted of a pine tree, a fish, and a set of five arrows. The arrows stood for the five counties at the time, while the pine tree and fish represented the state's major economic resources. In 1784, when the state's new constitution became effective, the legislature decided to change the seal to keep up with the changing times. The coastal town of Portsmouth had become a thriving ship building center, and the legislature wanted to portray this industry. So, with a rising sun in the background, the new design would feature a ship on stocks. However, as time went on, this 1784 design became a victim of artists' whims and fancies. The scene continually changed. People appeared on docks, and barrels of rum materialized. In 1931, the legislature voted to regain control of the seal's design. 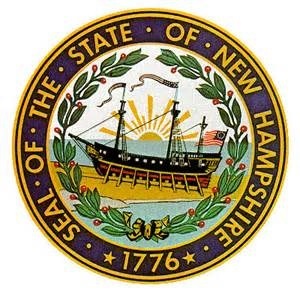 Today, the seal is unchanging (as seen on the state flag at right). The frigate Raleigh, one of the first ships that the Constitutional Congress authorized for the nation's navy, graces the center of the seal. The date on the bottom of the seal now reads 1776. The rum barrels are gone, the sun rises over the Atlantic Ocean, and a wreath of laurel frames the entire scene. 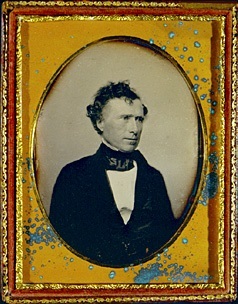 Franklin Pierce, 14th President of the United States, 1853-1857 - New Hampshire's only president. Born Hillsborough, New Hampshire, November 23, 1804. Died Concord, New Hampshire October, 1869. Look here for a review of Peter Wallner's excellent two volume Pierce biography. What Leonard Wood can teach today's America about running an empire. 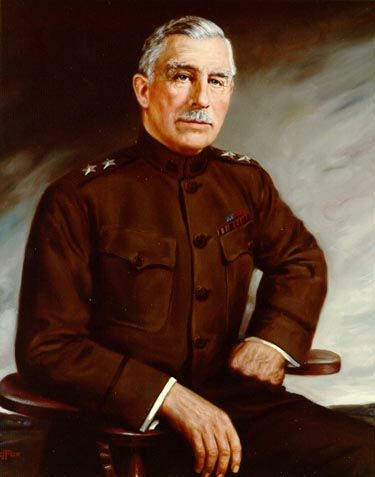 Biography of New Hampshire's General Leonard Wood, born October 9, 1860 Winchester, New Hampshire. 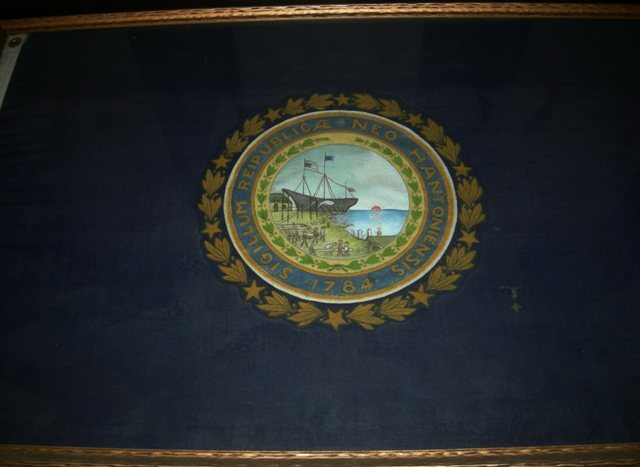 Candidate for President in the 1920 New Hampshire First in the Nation Presidential Primary. The first Thanksgiving was celebrated in 1621 when Governor William Bradford proclaimed a three-day feast after a successful harvest, following the devastating winter where over half their members died. But do you know the role New Hampshire has played in this most American of holidays? As early as 1781, the Continental Congress in Philadelphia proclaimed November 28 “as a day of solemn thanksgiving to God for all his mercies,” and sent copies of the document to each colony (see below). New Hampshire’s first Governor, Meshech Weare (the official title then was “President”), ordered the proclamation “forthwith printed,” and delivered far and wide “to the several worshipping assemblies in this state, to whom it is recommended religiously to observe said day, and to abstain from all servile labor thereon.” So much for the mythology of a “separation of church and state” mindset among the nation’s founders. In fact, days of “thanksgiving, fasting, and prayer” were common in the founding era, and a holiday commemorating the Pilgrim’s sacrifices after harvest was popular throughout the 13 colonies, although not observed on a common date. George Washington was the first president to declare a national Thanksgiving Day under the new Constitution in 1789. Thanksgiving remained popular throughout the country during the 1800s, but it was the 35 year crusade of a New Hampshire woman, Sara Josepha Hale of Newport (above), author of the anti-slavery best-seller, Northwood, and a powerful editor of a national magazine, that persuaded President Abraham Lincoln, who Sara had personally lobbied, to declare the last Thursday in November a national holiday in 1863. In an effort to extend the Christmas shopping season following the Great Depression, President Franklin Roosevelt, a Mayflower descendant, changed the observance to the third Thursday in November. After much controversy, however, Congress permanently changed the date back to the fourth Thursday in 1941.